Click the Bet button at left to choose your stake from £0.20 to £100. Or change your bet amount by clicking the up or down triangles. Choose the autoplay option to let it ride or choose conditional stops. Or just click the big spin button to start the game. All 20 paylines are active. Anytime a bonus feature is achieved, you can Collect the feature or Gamble to try for more. Even if you lose a Gamble, you still win a cash Booby Prize. Top Cat video slot is part of the Jackpot King progressive network, triggered by the appearance of 5 JK symbols. In the ensuing bonus game, collect crown symbols and climb up the ladder. Get 15 or more and you enter the Wheel King section to spin for possible Big Win Multipliers and the Progressive Pot. Maximum single-game win in TC is £250,000 or 10,000 x bet – whichever is reached first. Brain’s Water: As reels spin, Brain appears with a fire hydrant near each reel. He uses his wrench to release water from each hydrant, potentially turning each reel wild before moving on to the next reel. Choo Piano: As the reels spin, Choo walks onscreen to the centre of the reels. Brain swings in on a rope and a Piano drops on Choo’s head., causing a bump accompanied by stars which float onto the reels and turn symbols into wilds. Spook’s Mice as Nice: TC appears from his rubbish bin blowing his whistle. Mice appear next to each reel symbol, rearranging them for wins. Whenever TC blows, the mice rearrange wins till Dibble the cop appears. Benny’s Colossal TVs: As the reels spin, Benny appears, pressing a button on his remote, adding TVs to the reels, each bearing a symbol concealing a mystery prize. Cash Picker: in a back alley, pick rubbish from a garbage truck. Choose a bin and hope for the best! Maharajah Heist: A multiplier trail leads up the side of a hotel, and a big money board lets you roll a die. Get high, win more! Diner Free Spins: Sit with the gang at a diner counter. Meal-tickets buy you dishes with various bonus values. Dibble’s Free Spins: Set in a rain street, different wilds appear and sometimes collide or cover multiple reels until all free spins are used. Construction Site Wilds: Multiple wilds appear, letting you to collect TC stickers moving from reel to reel. The higher you reach, the more free spins you win. Fancy Fancy’s Hot Dog: A street vendor appears with his cart. FF and the Gang appear with a fishing rod, re-spinning the reels. With each spin the cart moves to the left. This fishing expedition goes on till the cart has moved to the first reel. Only then does the enraged vendor return to reclaim his lost (or stolen!) property. Top Cat features simple cartoon-like graphics of TC and all the members of his Gang, as well as playing card symbols. The real fun comes when the bonus features trigger animations and recordings true to the spirit of the classic TV show, including the Brooklyn-accented Boss. 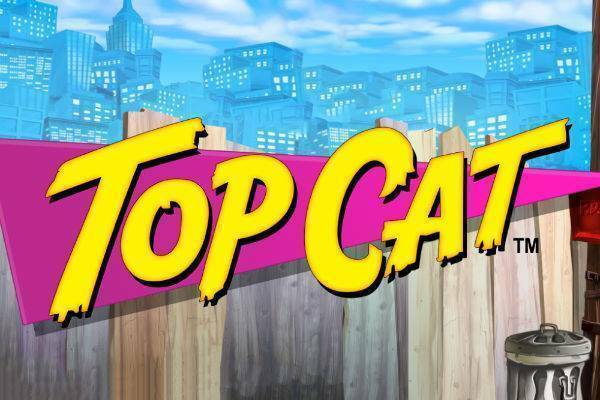 With tons of bonus features and animals wreaking havoc on the reels, Top Cat and his fellow felines can turn you into one fat cat overnight! Give these naughty, witty kitties a spin at one of our recommended slot sites and you may soon find yourself – with your newly acquired sports car engine – purring.